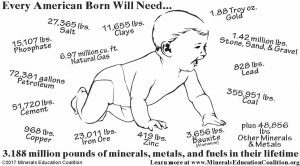 The mining industry is fond of saying, “If it isn’t grown, it’s mined.” And it’s true: every material used in modern industrial society is either grown in or derived from Earth’s natural mineral resources. What would our lives be like without mining? Imagine a world without bicycles, cars, railroads, cell phones, medical-care items such as X-rays and surgical tools, or even electricity and modern plumbing. We wouldn’t have any of these things. Natural resources are the foundation of our lives and lifestyles. And, to maintain these modern levels of comfort, the amount of natural resources required per capita for an industrialized nation can be staggering (e.g. see graphic for the US). The concept of mineral resource sustainability and development weighs heavily on the mind of the international community, given that our Earth has a fixed quantity of mineral resources needed by an ever-increasing human population (currently ~7.5 billion), all of whom want modern comforts and amenities. Although this issue of Elements can’t come close to addressing all the complexities of mineral resources and sustainable development, the authors have provided articles that introduce us to the origins and economics of mineral resources, the different mining methods required to sustainably extract these resources, plus the different processing techniques needed to refine them. We are also provided with examples of how geochemical research can help solve the complex environmental legacies of mining. And, we are challenged to educate the next generation of geoscientists who will be responsible for finding and developing the resources needed to sustain a nation’s standard of living, its domestic national product, and its position in the world. On Sunday, 13 August 2017, the Elements editorial team held their annual staff meeting in Paris (France). The meeting was an invaluable opportunity for our international team to discuss, face-to-face, editorial matters. We addressed the problems and logistics of handling manuscripts, evaluating proposals, setting the topical lineup for the first half of 2019, and we explored the challenges and opportunities for our magazine in this digital age of the internet, social media, and YouTube. We also met with the Elements Executive Committee. The members of this committee represent the 17 participating societies and it is they who oversee the financial aspects of our publication. It was a long but productive day. One of the most time-intensive discussions for the editorial team involved the evaluation of the 13 thematic proposals submitted for the Elements 2019 lineup. This was a challenging task because the team only schedules three to four issues at a time. We evaluated each proposal with respect to the potential interest and relevance of the topic for our diverse readership; we assessed how well the proposed topic would be covered by the suggested articles; and we considered the qualifications and diversity of the proposed authorship. On the basis of these discussions, we accepted the following thematic proposals: “Planet Mercury” (February 2019), “Reactive Transport Modeling” (April 2019), “The South Aegean Volcanic Arc” (June 2019), and “Weathering: A Unifying Process in the Geosciences” (August 2019). If you missed our last proposal deadline, we invite you to submit your ideas to us by 15 January 2018 when we will finalize the remainder of the 2019 lineup.